After writing Charlotte Bronte's Thunder, I decided to write a fictional account that would present some of the material found in the nonfiction, and provide an entertaining introduction to the controversy. 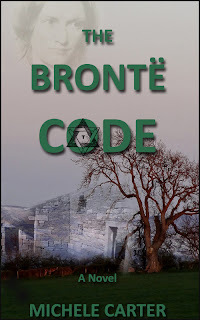 The Bronte Code became a murder mystery set in Haworth. When the story opens in the present-day, Lucy Owens, a struggling journalist from San Francisco, has made her way to Haworth, in the north of England, to visit the Brontë museum and to immerse herself in the local scenery. While in the village, Lucy's absorption of Brontëana lends a slight dissonance to her musings when she learns she shares several odd, life coincidences with her favorite Brontë sister, Charlotte. Nonetheless, she roams the moors to retrace the steps of her literary muse with the hope that she will connect with her own talent as a novelist. Her adventure begins during an afternoon ramble among the heather and harebells. Haunting cries and the image of a man (Heathcliff?) draw her to an abandoned farmhouse where she discovers a body. The dead man is Danny Cowan, and his ancestry links back several generations to the 1840s when the Brontë fictions were first published. Lucy's curiosity drives her to investigate the murder, which leads directly to Jane Eyre and Wuthering Heights. Her interest in Charlotte and the strange similarities in their lives create a further pull beyond simple curiosity. The undercurrent of a mysterious force, while frightening, enables Lucy to crack a secret code that's been hidden in plain view for over one hundred and sixty years. Your level of enjoyment is not predicated on your level of knowledge of Brontë lore or literature: the book introduces you to the Brontës and expands your awareness of their story while inserting a dab of romance with a dash of controversy.